In a messy, impossible-to-predict meta, Vitality looks right at home. This feels incredibly bizarre to type out, but here we go—Vitality just won the first EU LCS game of the split over Splyce using a Fiddlesticks and Heimerdinger bot lane combo. No, that isn’t a joke, and no, it isn’t even considered a troll or cheese pick (okay, it’s a little cheesy). That’s just the meta we live in right now and, if anything, it’s definitely entertaining. Splyce’s mid laner Yasin “Nisqy” Dinçer also whipped out Irelia mid, and Vitality top laner Lucas “Cabochard” Simon-Meslet locked in Aatrox, following in the footsteps of the LPL earlier this week. Welcome to the 2018 Summer Split. The reason picks like Heimerdinger, Fiddlesticks, and even Vladimir and Yasuo in other regions, are coming out of the woodwork at the start of the split is fairly simple. They’re suddenly in-meta because they can be. The only thing holding the bot lane Pandora’s Box closed was, it seems, crit ADCs. 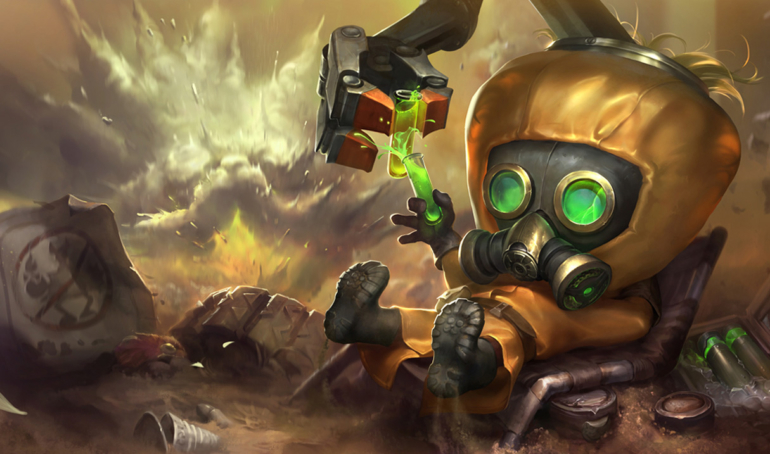 After massive nerfs to marksman base stats and crit items in Patch 8.11, champions that were previously punished by the huge one, two, and three-item crit power spikes on marksmen were suddenly able to jump into the spotlight. In fact, the few marksmen who are still prevalent in the meta are non-crit marksmen like Kai’Sa, Lucian, and Ezreal, and even then, they lack the sort of aggression and snowball that bruisers, tanks, and, in this case, mages can provide. For the most part, as long as you can fill these three areas, you can lock in whomever you want in the current meta and get away with it—tower-taking power, sustained DPS, and a decent front line. Heimerdinger fills the roles of tower-taker and sustained DPS, while the top lane Aatrox is also sustained DPS but also a pretty good front line with Skarner. Fiddle was just some added flavor using crowd control and big AoE damage in teamfights. Vitality built a reputation last split of being incredibly unpredictable and confident in strange picks, and their wide range of champions combined with that unpredictability fits right into this meta. If the meta settles down, though, they’ll need to prove that they can do what they couldn’t last split and take down a slow meta-adapter like Fnatic.